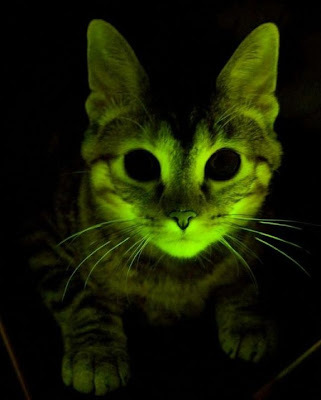 It may look more like a case of photoshop manipulation, but the only thing that's been modified in these incredible images of glow-in-the-dark kittens were the genes used to create them. The Daily Mail reports that researchers at the Mayo Clinic,"used harmless viruses to transfer genes into eggs removed from pet cats during routine spaying. One gene makes a fluorescent protein, the other produces a protein that fights off feline immunodeficiency virus, or FIV, the cat version of HIV. The eggs were then fertilized through IVF and implanted in surrogate mothers." The kittens' day glo coloring, which can only be seen in the dark, was achieved by injecting jellyfish genes into the eggs, and used to show evidence that the genetic tinkering was successful. 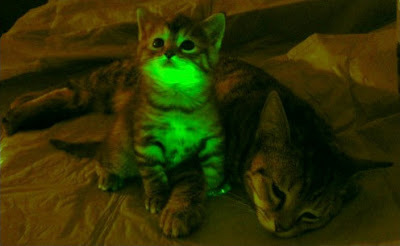 In addition to their glowing green aura, the three kittens born from the experiment were also shown to be better at resisting infection with FIV than normal cats. This new research could potentially help lead to a cure for human AIDS (and possibly nighttime tripping, too), and may also be critical in creating a vaccine against FIV, a chronic disease in domestic cats that suppresses their immune system, greatly reducing their ability to fight infections due to a lowered white blood cell count. 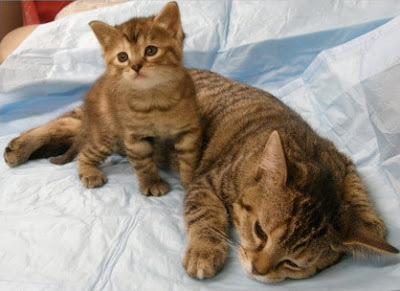 The disease can be transmitted to other cats through deep bite wounds, however cannot be passed on to humans, or other species of animals. While incurable, and often seen as a death sentence to cats in public shelters, the symptoms of FIV can be managed, and cats with the virus can still go on to live long, healthy lives. Wow! My LL wants a glow in the dark calico! I sincerely wish before posting things like this that writers would do more research on biotechnology. First, there is NO SUCH THING as a harmless virus! Viruses mutate so rapidly in nature. There is no way they can possibly guarantee that the virus used to insert the new genetic material will not in the future mutate, creating an as-yet-unknown disease. There is mounting evidence this is the source of many new and mysterious diseases now being seen. Autoimmune disorders in particular have been linked to genetic insertion via viruses. AIDS and FIV are both immune system disorders the source of which is still unknown. Many feel biotechnology experiments such as this may in fact have been the true point of origin of these diseases. I really hate seeing articles like this. I spend a good part of my free time trying to educate people about the dangers of uncontrolled biotech research such as this. Then when I see articles like this, I can't help but feel like I have been wasting my time. Evidently me and thousands of others are simply not being heard. This is NOT good science. Do some research. There's lots of info out there that will scare you half to death. Believe me, it's nothing to laugh about. There are truly horrendous things going on in this field. This is simply animal experimentation of the very worst kind. I cannot understand people who insist that cosmetics and medicine not be tested on animals but think stuff like this is not only OK, but even FUNNY. Let me put it another way. If you heard the same thing about glow-in-the-dark kids, would you run out and have your eggs modified so you could have one, too? How would you like it if this was done to you before birth, without your or your mom's consent? Do you know how a cat's body is going to react to jellyfish proteins, something that is totally alien to a cat's body? How will other cats react to these cats? This is what I call Frankenscience. There simply is no other good way to describe it! Awww! How cute! I want a glow in the dark kitty cat!